The Regal Rhydon! Pokemon One a Day! Let's start things out with a fun fact...Did you know that Rhydon was the first ever Pokemon to be created Satoshi Tajiri? Back when the series was known as Capsule Monsters, Rhydon can be seen in concept art, alongside precursors to creatures like Nidorino and Gengar. 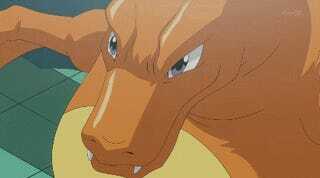 That said, the rhinocerous like beast would slowly get molded into the Pokemon we know today as Rhydon. This would explains why in the first games there were Rhydon statues in places like gyms, placed in homage of sorts. So with that in mind, I thought to turn Rhydon into a crest decal of sorts, as a symbol for the house of Pokemon based on that fact. You don't normally see Rhinothings as this kind of sigil but dragons, lions, and birds usually take the spotlight so this may look odd for a bit. I went this route also because I saw a particularly gorgeous styled crest that inspired me to make one for Pokemon. Perhaps another Pokemon would be better to represent the series as a whole, but Rhydon seems to be important to the creature so I wanted to respect that. So anyway, it doesn't really look like a traditional crest, does it? It got a bit abstract pretty early on, and that's because the art I saw and was inspired by kind of led me in this direction. I used that work as a reference and made tweaks to it to give this piece a very twisted and lively shape. 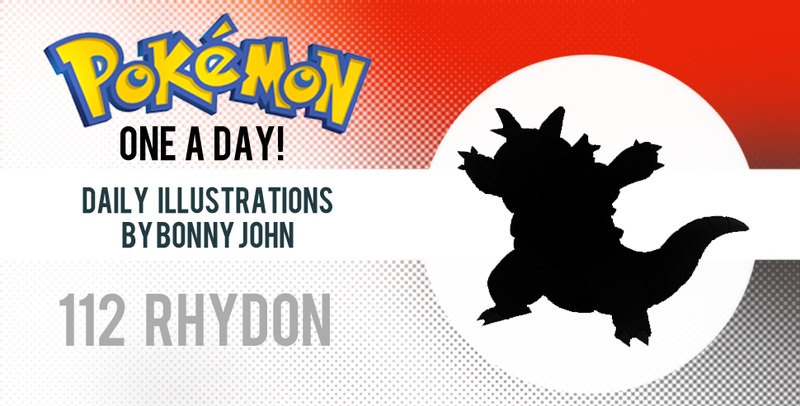 The art is an active nod to the spiraling drill that sits a top Rhydon's head. The work in this pose sorta resembles a sigil or emblem, but everything else moves into what looks and feels like a contemporary piece of fine art made of metals. I didn't add bolts or screws because it would've gone closer to Rhyhorn's design, which was very industrialized. Fun fact about the two Pokemon illustrations: I muted Rhyhorn's grey to make this one a cool grey/steel blue because I thought it would look better here than yesterday's tank! As for the approach to painting, I was conscious about having the surface of the work look like steel as I didn't want Rhydon to look like a steel type, but I put away that thought because I didn't have a piece of work for this series that had this aesthetic and so this can diversify things further for the gallery. I think the end result looks nice in this capacity. Overall, work on the piece was straight forward and more time consuming than anything. I enjoy putting out works that give me a lot of wiggle room. This power over the abstract works puts me at ease and lets me create without too much fear of getting something wrong, like anatomy or lighting. It's a day to let loose when I go abstract! So there you go, one Rhydon complete! Hope you like the work and enjoyed a little bit of insight on the creature and the artwork.